Why is 3D printing important for the space industry? 3D printing could revolutionize space exploration by helping astronauts to create objects in space and on demand: replacement parts for repairs, custom equipment for scientific experiments, and even things like food or buildings! Indeed, while space is an extreme environment with very few exploitable raw materials, there is plenty of dust floating around. 3D printing technology allows you to build solid structures from aggregated dust and microscopic particles. The European Space Agency (ESA) is considering 3D printing their base on the moon. As for 3D-printed meals for astronauts, NASA is funding a project of Systems and Materials Research Corporation to develop a 3D food printer, usable in zero-gravity environment. Thanks to 3D printing technology, it is now possible to manufacture spare parts in space. NASA and Made in Space are collaborating to solve that problem. The result of their experiments is the zero G 3D printer, a 3D printer that can operate in zero-gravity environment. 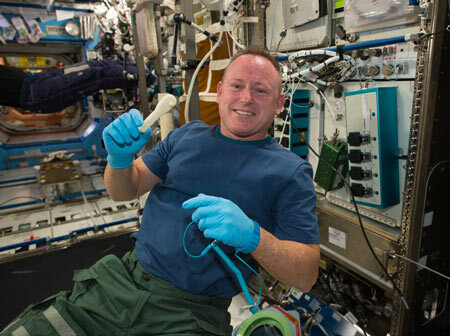 They managed to create a ratchet wrench from a 3D file emailed from Earth to the space station. This 3D printer uses the Fused Deposition Modeling technology and can print objects in plastic. Nasa project Manager Niki Werkheiser. Ratchet 3D printed in space by the Zero G 3D printer. 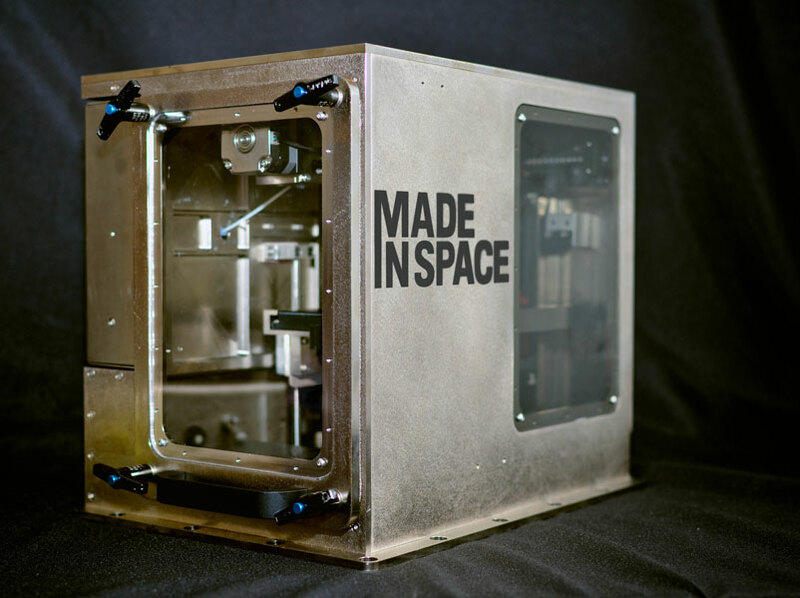 The Zero G 3D printer by Made in Space able to 3D print in space. 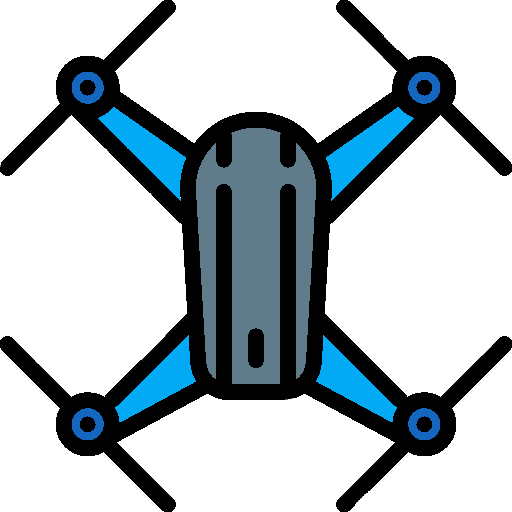 Sending a simple spare part can last several months and costs around $17,000 per kilo. In less than a week, the 3D file of the custom ratchet was designed, sent in space and then manufactured by the 3D printer. The next goal is to have a database of 3D files of all the parts needed in the space station, in order to save time in case one breaks. Being able to recycle 3D printed objects that are no longer needed and reuse the 3D printing material is also a big focus. 3D printers have the capacity to create a variety of products with a small amount of raw materials. Thus, engineers found here the perfect technology for feeding astronauts on long-term space missions. NASA has invested $125,000 in SMRC, an ambitious project led by Anjan Contractor. 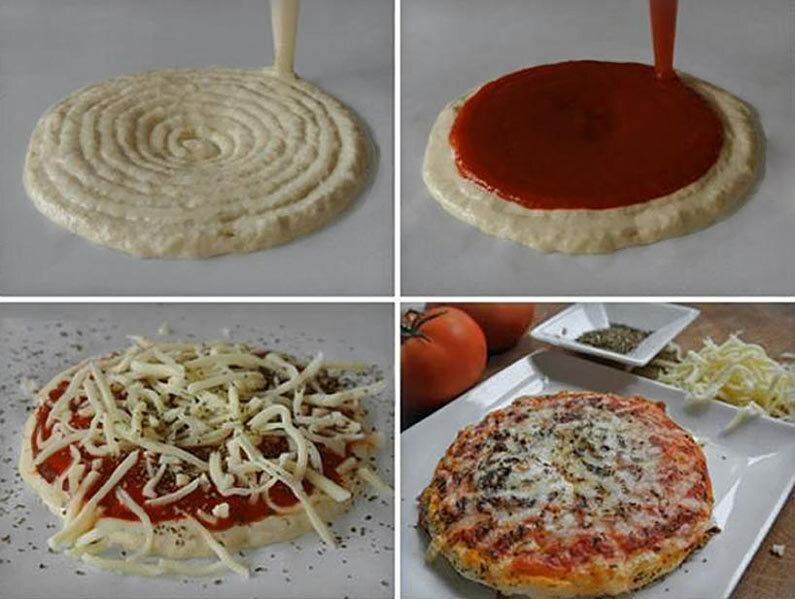 He succeeded in creating a 3D printer able to 3D print a pizza in space. This process allows to cook a pizza in a few minutes and according to Anjan Contractor, carbs, proteins, macro and micro nutrients stored in a special cartridge in powder form stay edible for around 30 years. This would be enough for a mission between Earth and Mars. Thanks to the 3D printing technology, the European Space Agency hopes it will be one day able to 3D print a base on the moon. The international studio for architecture Foster + Partner has designed such a structure in partnership with Monolite UK, which provides the 3D printer. According to Foster + Partner, the base must be assembled around a dome built on Earth. This dome will filter gamma rays, solar radiation and meteorites impacts. On the moon, two 3D printers would finish the build and strengthen the structure by using raw materials found on the spot. Currently, Monolite UK says that their 3D printer is able to achieve a complete base in less than two weeks. The next generation is claimed to be twice as fast as this one. 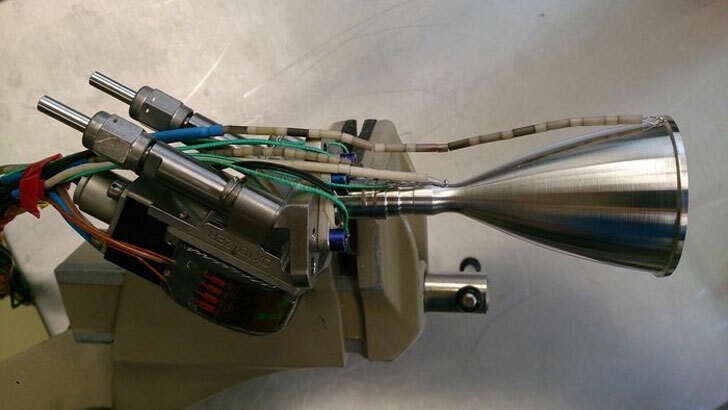 The world’s first 3D-printed thruster chamber. 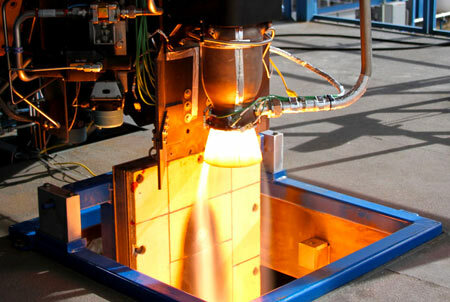 The SpaceX rocket engine using the 3D printed oxidizer valve during a test phase. 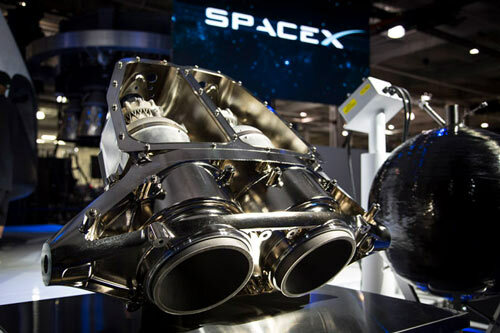 The 3D printed SuperDraco rocket engine by SpaceX.